How delicious is this bathroom? It's classic but it's also fresh. Ok, the mosaic half walls must cost a fortune, but they look so good. 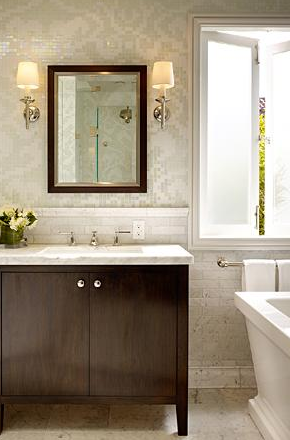 I like the pairing of the mosaic tiles with the marble tiles. It adds another dimension to the design plus it cuts down the cost by only using the expensive mosaic tile on half the wall. Now that is smart design. The wall sconces are also perfect, so is that bathtub and vanity. Everything looks so soft and soothing. My second favorite detail in this bathroom is the wall mount tub fixtures. It's rare that people go for wallmount faucets for their tub so it always stands out and adds a little something special when it is used. Thanks so much Chelsea! When you are getting ready to redo your bf bathroom if you have something in mind or can't find photos of what you are looking for drop me an email (mikky@todaloos.com) (or just leave a comment in a post) and I will track down some photos for you. Don't be shy.